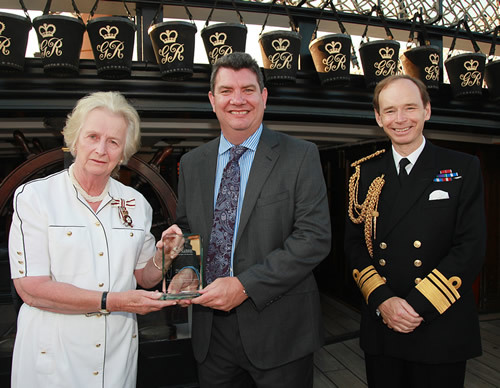 NATS was one of 13 southern-based companies to receive a special award from the South East Reserve Forces and Cadets Association at a reception on board HMS Victory in Portsmouth earlier this month. The award was given in recognition of NATS’ support of its reservist employees, who continue to play a vital role in operations in Afghanistan and other theatres around the world. It was organised by the South East Reserve Forces and Cadets and the Ministry of Defence campaign – SaBRE (Supporting Britain’s Reservists and Employees). Martin Rolfe, NATS Managing Director Operations (middle) collects the SaBRE award on behalf of NATS. He is pictured here with Lord Lieutenant of Hampshire, Dame Mary Fagan DCVO JP (left) and Vice Admiral David Steel CBE, the Second Sea Lord and Naval Chief of Home Command (right). Martin Rolfe, NATS Managing Director Operations, received the award on behalf of NATS from Lord Lieutenant of Hampshire, Dame Mary Fagan DCVO JP and Vice Admiral David Steel CBE, the Second Sea Lord and Naval Chief of Home Command.